Give your fresh berries a quick rinse, and shake of any excess water. Stick the berries in a blender (or use a handheld blender and a tall measuring cup like i did). Strain the smooth blended blackberry liquid through a sieve, to remove the seeds. Then simply mix with some coconut milk (or coconut cream if you prefer it to be creamier) and a little honey. 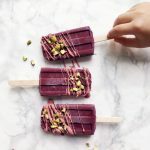 Pour the blackberry coconut mixture into your Popsicle molds. And place the molds in the freezer overnight or for minimum 4-6 hours. Once frozen you can decorate them in anyway you like or just leave them as they are – plain and simple. They are delicious no matter what. If you use frozen berries, blend the berries together with the coconut milk and honey before passing it through a sieve to remove the seeds. that way the liquid is thinner and it will be easier.